Written words on the site. Our days have been a bit more leisurely as we headed west to Thimphu and Paro. The drive kind of lulls the traveler to sleep and we made our way back from Trongsa on a much improved roadway. We stopped for a bite at the Lobesa Café and Hotel, a wonderful spot run by a local family. We took in one last view of the Lobesa Valley and the Temple of the Divine Madman before heading into Thimphu. 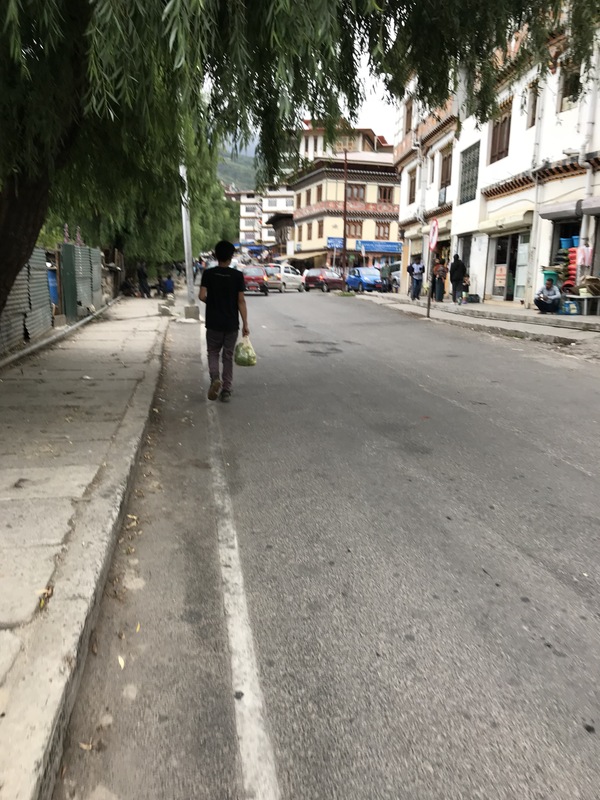 At pretty much every waking hour, Thimphu is a bustle of activity. The cars crowd the narrow streets and people are, literally, everywhere. Into this crowd we headed to Hotel Osel, dropped our bags and headed out. Most of us headed to the Vegetable Market and the Crafts Market along the river. Since it was Sunday, many were off work, especially the Indian construction workers, and so we saw hundreds of these migrants carrying bags filled with all kinds of vegetables. The one we saw most was the Bitter Gourd, a kind of prickly green cucumber sized vegetable. The men were loaded down with these foods as they planned to head back to their various camps in Bhutan. In fact, Bhutan runs on this immigrant labor. At every spot in the city and in the country, these workers are building roads, houses, buildings, and doing almost every kind of hard labor in the country. These folks cannot become citizens and are on a kind of guest worker program. They stay in very humble quarters, usually trap-covered structures scattered in the city and along the roadways. I had the chance to talk to a group of these folks and they expressed their luck at finding decent work. All send money back to family in India and they are from just about every part of the country. I asked about their families and many had children and partners bqck home. All hoped to finish work here in a few years and head back. As we walked through this mass of humanity, every single one of us are struck by the smiles….as I mentioned before it’s hard to stop smiling here. People who are struggling smile, people who are well-positioned smile…it’s everywhere. As you walk through the markets and among the people in the city, people make eye contact and smile. So, it’s easy to think that those smiles are reserved for paying tourists, but you quickly realize and see that it is not about that at all. We witnessed a minor fender bender and people calmly got out of their vehicles, talked about what happened. The driver responsible claimed responsibility, numbers were exchanged and it was over. That small incident is indicative of Bhutan. On the following day we headed to Paro, the place where the airport is and where we would hike to Taktshang, the Tiger’s Nest. On this drive to Paro, we headed up to Chele-la Pass the highest pass in the country at 4,000 meters. We went in search of the elusive Blue Poppy, a type of flower unique to this part of Bhutan. We hiked up about a ½ mile above tree line, finding the flowers…just a few, on the carpeted tundra flora. Back in Paro, our group stayed in the really wonderful Hotel Olathang, the first hotel constructed for tourism in Bhutan. The grounds are beautiful and we stayed in little cottages scattered over the grounds. The rooms are rustic but very nice. A great place to rest and prepare for our hike tomorrow. We headed back to Paro and stayed in the really wonderful Hotel Olathong, the first hotel constructed for tourism in Bhutan. The grounds are beautiful and we stayed in little cottages scattered over the grounds. The rooms are rustic but very nice. A great place to rest and prepare for our hike tomorrow. OK, I get it. 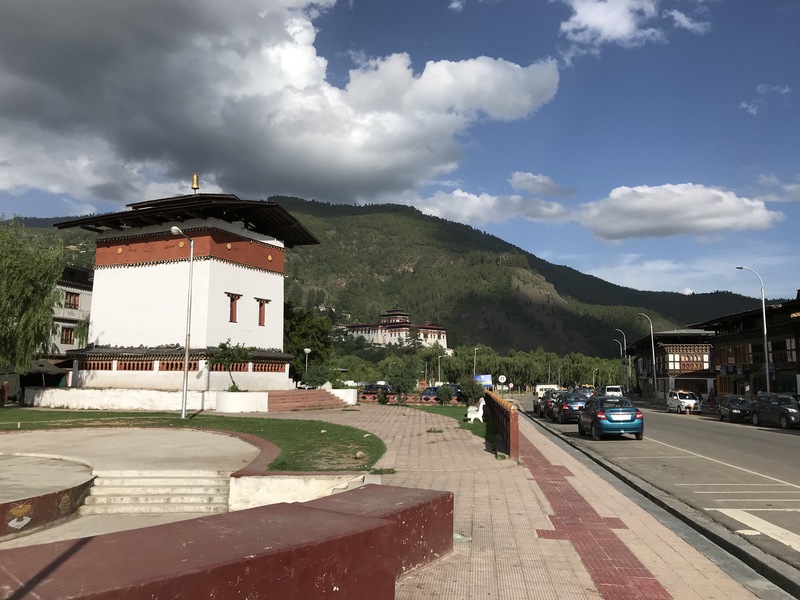 I tend to gush about Bhutan, the people, the experiences, the moments of sheer unadulterated laughter, the kinds of conversations that open you up to a wider world and new ideas that transform one’s mind and heart. Bhutan has always been that place for me. And…and it’s the students that have brought joy by seeing their eyes opened to another way of thinking, to see another kind of world, one that they will, without question, run. I am heartened by the fate of our planet when I see these people finding their way through moments on this trip. It is at once life affirming and truly wonderful in ways that transcend the moment. That prologue leads me to this day. It started as it ended yesterday in rain; pouring rain at Yangkhil. We made it to breakfast and were ready but weary of what we thought was to come: a day of slogging through the mud. At the same time, this is Bhutan, and happiness is not too far away from one’s mind in this place. We gathered on the bus and headed to Trongsa Dzong. The rain eased slightly as we walked, almost entirely alone, through the courtyards of this massive structure. As we meandered around, monkeys climbed all over the roof tops and along the walls. They came in pairs and scoured the grounds looking for food. 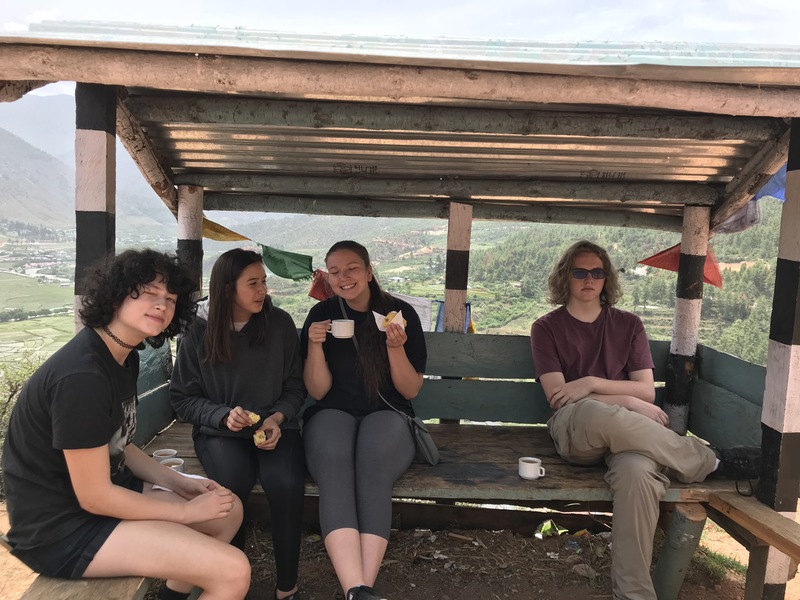 We walked into the upper courtyards toward the classroom for novices and Namgay regaled us with the story about the stages of life and the three poisons: ignorance, lust, and fear. We listened intently as he told us of Buddhist cosmology and understanding of the world. By the end, questions were asked and our minds were opened to how this culture, these people view their world. It was an insight few people have the chance to hear. The rain slowed markedly, and we headed to a local growers market, looking at the wares and wondering at some of the vegetable produce. Even Namgay had no idea what some of the fruit or vegetables were, commenting, “they must be from India.” When we asked other Bhutanese folks, they were equally flummoxed! That one mini experience was the kind of day this one turned out to be. A shared, joyful moment in time. After the market, we boarded the bus once again to brave the treacherous road. The mud, sand, and gravel mixed into a light brown goo spread across the roadway as we headed up the hills toward Pele-la pass. The thing is, something had happened. The weather was still yucky, the road still a mire and yet we had somehow changed. The challenges seemed less difficult; even our driver commented on how it seemed easier in some way. The mood, the feeling of the group was a little bit lighter, a little bit easier going. Along the way we made two stops: a waterfall near the road and a small restaurant. The waterfall was gorgeous, the water coursing down the rocks into the stream that crossed under an ancient looking bridge. The bridge, covered in moss and lichen, was clearly crumbling around the edges and one section of its wall had entirely collapsed making way for water on the bridge to flow into the stream below. I won’t bore you with our stop for food. We headed up the road toward the pass and then on to Phobjikha Valley. This massive valley, cut long ago by a receeding glacier, is awe-inspiring. The landscape opens in a way that is rare in Bhutan…a wide valley with a small stream running through the center. We found the start of the trailhead for the trail that spans the valley, and made our way along the hillsides to eventually land in the floor of this verdant landscape. Along the way we saw cows, yaks, horses, donkeys, and the occasional monk. Our group split into two. One group chatting the whole way made it to the road very quickly, as the conversation spilled out into this open space. The other group found a patch of wild strawberries and gathered hundreds. Namgay taught the group how to make a basket from ferns to carry the bounty and they made their way, much more gradually, back to the road. It’s in these moments when one realizes what perfection is. We all found, in our own way, the perfect day, the perfect moment, the perfect experience. It could not have been better, it could not have been different. It was magical in ways that only Bhutan, it seems to me, is capable of creating. I know, I know; these experiences can happen anywhere. Yet, I must say that on this day and in these few hours, you would have a hard time convincing me of anything else. 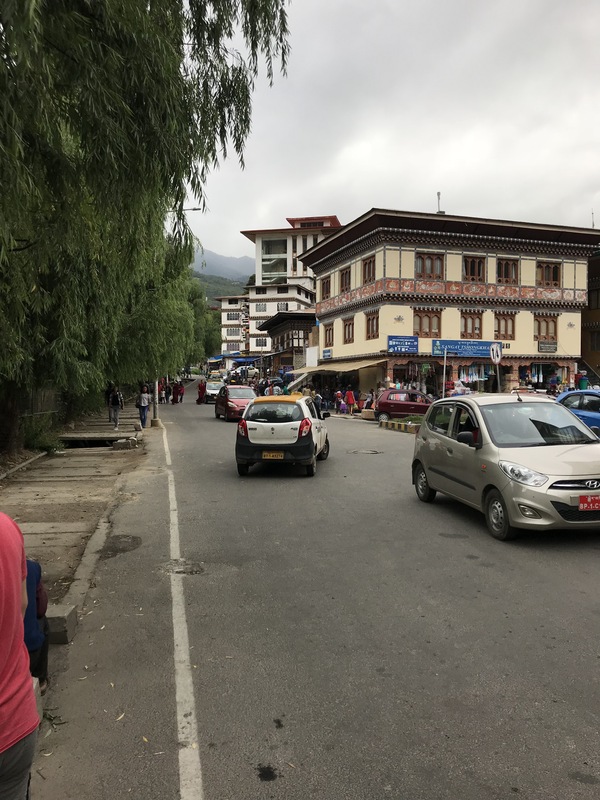 We left Punakha, boarded our vehicle and bounced, rambled, and otherwise headed down the road toward Trongsa in Central Bhutan. The day started overcast with bits of sunlight streaming through the clouds; however, as we neared Wangdue-Phoedrang and the river communities of the Lobesa Valley, the storm clouds gathered above the mountains surrounding us on three sides. Traveling in Bhutan on the main road through the country is a testimony to patience. One has to relax into the journey because, at some point, something will hinder your progress. As I’ve said before, to be in Bhutan is to let go of expectations of traveling on a set schedule. This one lesson could be among the most profound one can learn in this land of happiness. Along the road all over Bhutan are small tea houses like Nobding Teahouse in Nobding. A cup of tea in this setting? I think so. So, we drove up into the central region of Bhutan climbing in elevation from the valley floor of about 3,000 meters. The road winds back and forth, contouring around the mountainsides. As we climb, the hills become verdant with every color of green the eye can see surrounding the vehicle as we head up and up to the Pele-la pass. AS the bus drove on the clouds descended and we were, within about an hour of driving, surrounded by a fine mist. At one point, the road disappeared, and the black top of the highway gave way to the dirt track I have seen so many times before. Road construction has been ongoing in the eight years I have been traveling to Bhutan. A massive road widening project was begun more than ten years ago and change the very nature of the highway across this country. From Wangdue to about 30 kilometers before Trongsa, the road is a smooth blacktop, the road wide enough for two cars to pass. However, the paved track ends and the construction of drainage channels, hard rock bed, and destruction of rock walls begins. On dry days, this road is a mere nuisance, a small inconvenience on the journey east. On this day, the mist turned into a full rain storm and the hard-packed dirt surface became a skating rink of mud. Our bus driver, Tenzin, is a remarkable man and he braved the elements both in the air and on the ground very well. As we neared our first stop in Tshangkhap and the Tshangkhap Central School, our pace slowed to a crawl. Rain came down hard and we faced a very narrow roadway filled with foot-deep ruts of mud. At one point we simply could not continue, and the bus stopped in the muck and mire of the road. Our driver, patient, practiced, rocked the beast back and forth until, in a few moments, he rocked the bus forward, through the dense material and down the road…we all clapped for joy at our luck. Through the view of the bus…a good section of wet road ahead. We finally made it to the small village of Tshangkhap, the home of my friend and guide Namgay. We pulled off the side of the road and headed to this rural school. The new dorm and a new road to Tshangkhap School. Even the dogs learn at this school. Since our last visit, the school has seen the construction of new classrooms and dorms for students. I brought with me money raised by our group for the school, fearing that in the face of these changes that our donation would be puny and impact small. I met with the principle and counselor of the school and we talked about the donation and establishing a letter writing exchange with Sandia Prep. When I handed over the funds from the fundraiser they were so glad to receive it and said that the impact would be profound. I was relieved. While I met with the administration, our students had brought hacky sacks to students and we disturbed those and played together for the rest of the afternoon. As you will see, the videos tell us a lot about our reception in a way words simply cannot. We walked in the hard rain back to the bus and our planned walk through the local village and visits with the farmers of the community were cancelled. We made our way to Yangkhil Resort, an absolutely gorgeous location directly across from Trongsa Dzong. We settled into an evening of food and conversation as the rain continued to pound outside. As I write this at 5:30AM, the rain continues to fall. Our plan is to travel back over the bog once called a road and drive to Phobjikha Valley and the home of the Black-Necked Crane. May our travels go as easily as possible and may you feel from afar our growing patient minds as we make our way west. Today consisted of a breathtaking adventure up the mountains of Punakha, Bhutan where we got to experience yet another mesmerizing temple. The gold plated walls and hand carved statues and intimate details of the shrines were indescribable. The 45 minute hike in the pouring rain was well worth it to reach the top and see the once in a life time views of not only the temple, but of the entire city, rolling mountains, braided river and clouds bellowing through the steep hills. 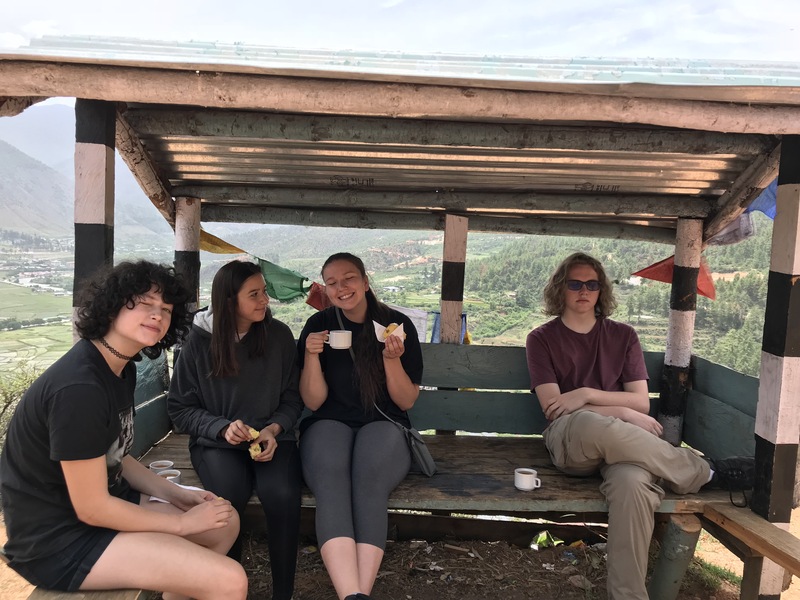 The slippery hike down, with a nice break to munch on some fresh corn, was equally beautiful and gave the perfect opportunity to talk and admire the adorable cows roaming the rice fields below. Once back into town and changed, we had a lovely picnic lunch down by the river, accompanied, of course, by numerous stray dogs. We then left to trek the longest extension bridge in Bhutan where a fairly equally matched rock throwing competition had to take place. Logan won. 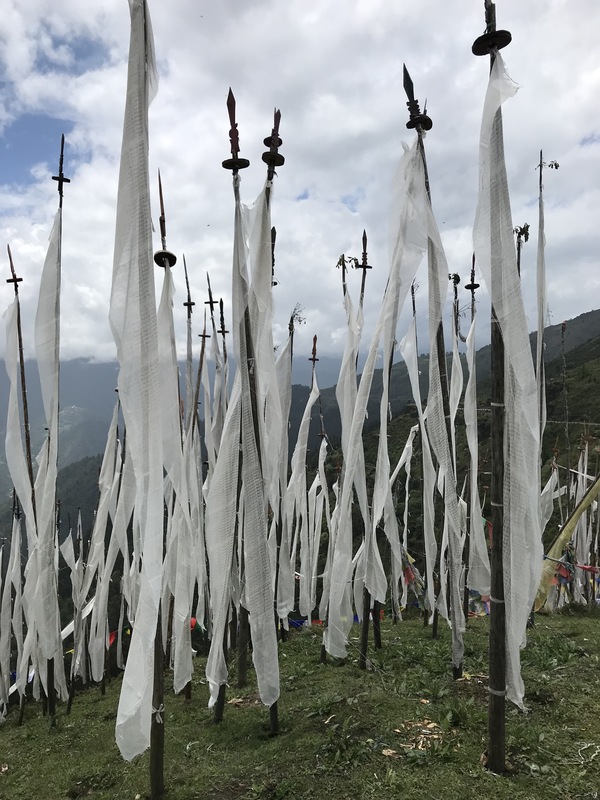 The beautiful fluttering prayer flags laced along the bridge led us straight back to the next temple where we learned the history of the Buddha and how to properly point in Bhutan, with all five fingers so none are selfishly pointed back toward youself. The day ended with some well deserved relaxation at our hotel on top of the hill, a delicious Indian dinner, and the anticipation of another spectacular day in this amazing country.